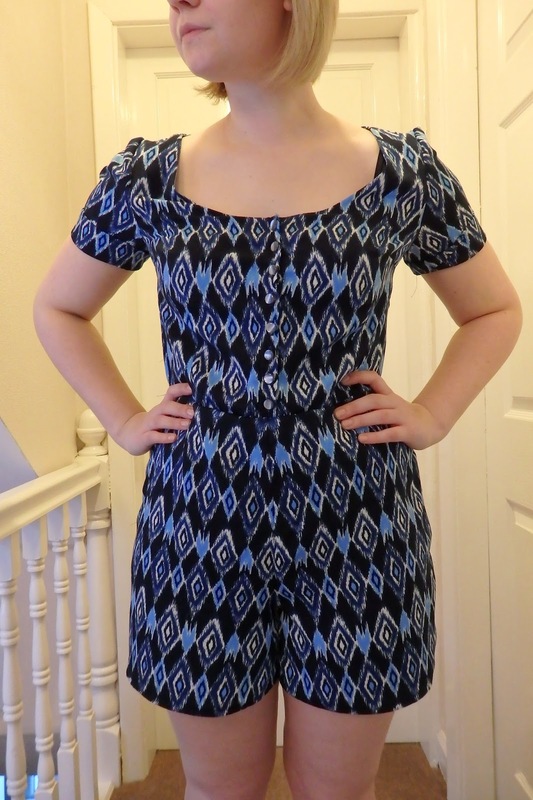 today i’ve got a new pattern to show off (new to me)… the by hand london holly jumpuit! it’s the first time i’ve made anything using a BHL pattern. i thought the instructions were really clear and found it all easy enough to follow. as you can see, i went for the shorts version with the short sleeves. 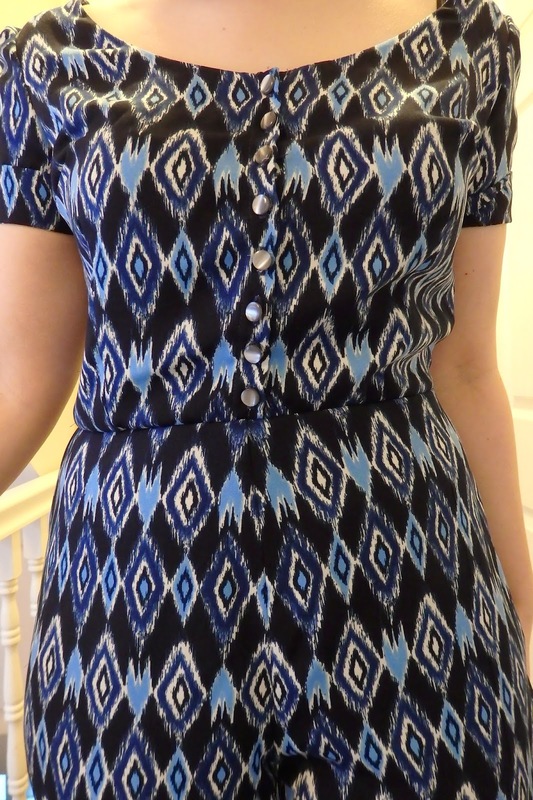 the fabric was bought with making this in mind, i got it from ebay, i think it was less than £4 per metre. i bought three metres and have fabric left over. if anyone wants it i’m quite happy to send it to you, i don’t have anything i want to make with it! when i was cutting it out i was a bit in and out of love with the fabric. like, is it a bit 80’s/90’s? i don’t know. however now it’s all made up, i love it. i haven’t made much with facings, i like how neat and tidy they are! which is happily inserted! first time round too! looking at these pictures it seems like i should have done a sway back adjustment, but i’m not entirely sure how comfortable i would be without that excess, and i’ll probably wear a cardigan with it. i tried as best as i could to get the pattern lining up and i think it’s quite even! the only mega annoyance i had with it was the fact i sewed up the wrong side of the shorts, i had to unpick them so i actually had somewhere to put the zip! however the rest of the construction went quite smoothy. i did it over two days and i’m glad i did because i make lots of mistakes when i’m tired. i’m not sure if i would make it again, mainly because i like to make clothes i can wear all the time (can’t see myself strolling around in this in the UK!) but if i did i would size up on the sleeves as they’re a bit tight. 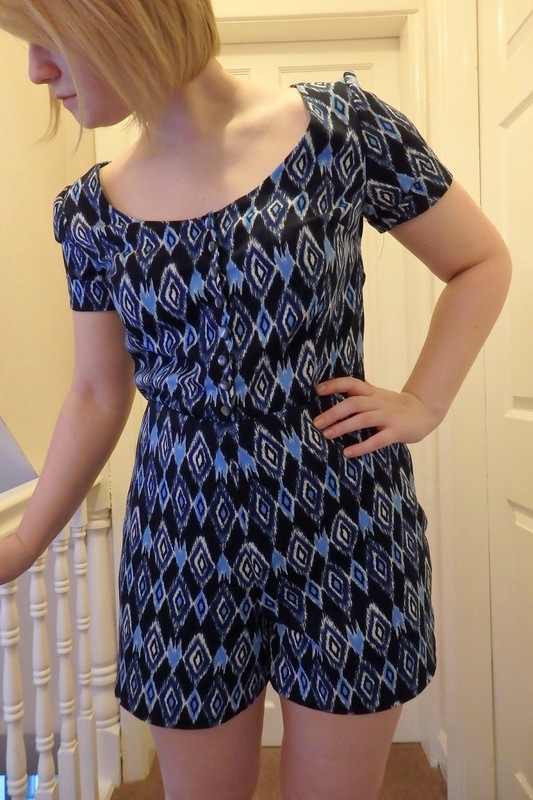 overall i’m happy with my final garment and i think the weight of my fabric (viscose i think!) works really well for this. thanks very much frankie! it was a bit slippery but worth it when it was finished! Oh wow, I LOVE it. The fit looks great, I think I'd have wanted to keep that extra room in it, if it were me. 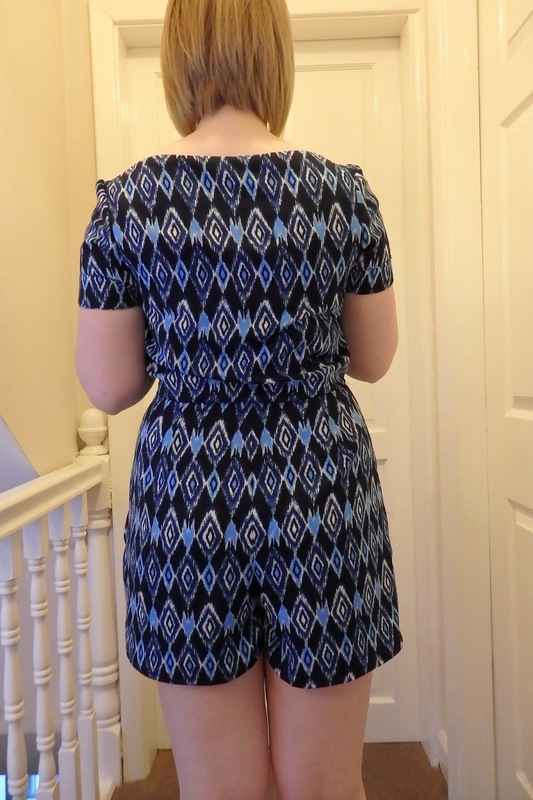 I wear playsuits for camping trips mostly, so it's important to be able to move. I wouldn't want it any tighter I don't think, no moving at all then! oo camping playsuits sound cute! thank you very much! 🙂 hopefully they will get lots of wear, they're definitely my favourite recent make! Love it 🙂 You seem to have really tapped in to what suits your body shape recently. You're going to have the most fabulous holiday wardrobe! aah thanks alex that's so nice! ^___^ we'll arrange a spring shopping trip to london when I'm back!! It's well cute! Perfect for holidays or a rare uk sunny day.